It’s fiction to think Ian Beale could afford to live on Albert Square! Property prices in the UK have soared in recent years, and even some of the country’s most loved soap stars would struggle to pay their mortgage in today’s housing climate. 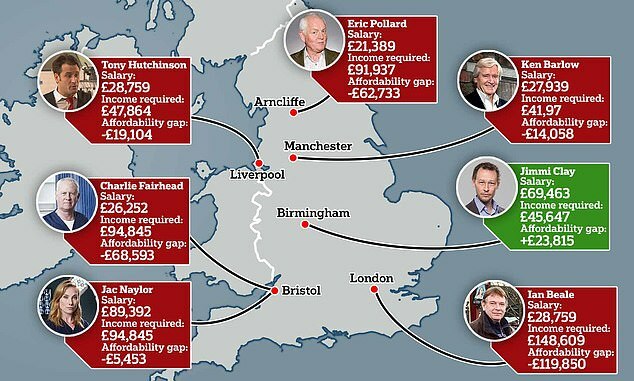 EastEnders star Ian Beale, Coronation Street‘s Ken Barlow and Casualty’s Charlie Fairfield would find it difficult to pay for their homes, according to research which looked into whether soap stars would be able to buy in their on-screen neighbourhood. Our own research has looked at the price increase in each character’s property from the time they joined the soap to the present day. They we examined the average earning for each star’s job, before comparing it to the salary required to secure a mortgage at 4.5 times the property’s current value for a deposit. Ian Beale has been a fan favourite on Albert Square for many years and has had a number of jobs since moving to the area. When he first moved to the square in 1985, the property would cost £65,000 on average. A huge 1,042 per cent increase since then means despite he is now sitting on £743,000. 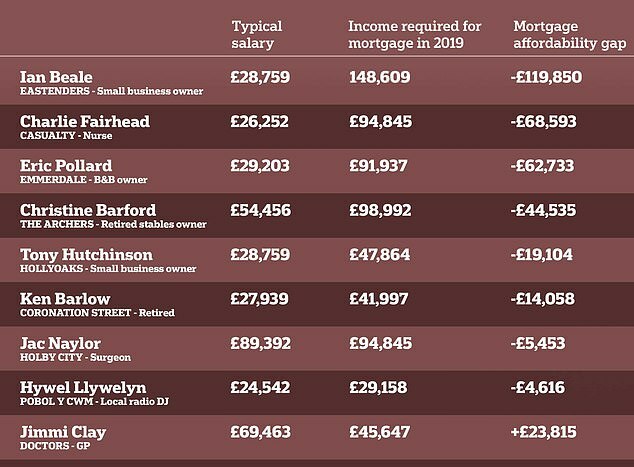 Yet the average small business owner only takes home around £29,000 a year, meaning he would be some way short of the £148,609 minimum income required to secure a mortgage were he to buy the same house today. 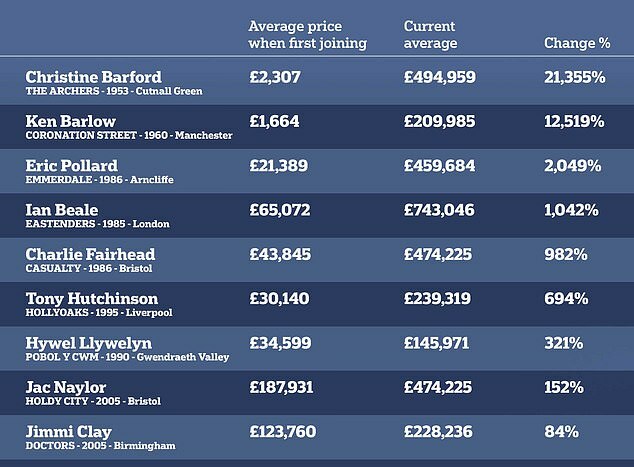 Charlie Fairfield has been a prominent figure in Casualty since 1986, and the average semi-detached property in Bristol has increased from £43,845 to £474,225 – a staggering increase of 982 per cent. Yet Charlie’s modern-day NHS wage of £26,252 means he would be priced out of the market by more than £68,000, meaning his annual income would have to be £94,845 in order to be accepted for a mortgage. Emmerdale’s Eric Pollard would also struggle to get his foot on the housing ladder today, as a detached house in Arncliff has increased by more than 2,000 per cent in value since he arrived on the show in 1986. Based on the average income of B&B owners, Eric would be nearly £63,000 short of the £91,937 income required to secure a mortgage. The longest-serving soap star included on the figures, Christine Barford of the Archers, would have been on around £54,000 as a stable owner before she retired. Having bought in 1953 for little over £2,000, the price of a detached home in Cutnall Green would have increased by 21,355 per cent today. Yet were she to buy today, she would be just over £44,000 of the £98,992 needed to secure a mortgage. The same goes for Tony Hutchinson, Ken Barlow, Jac Naylor and Hywel Llywelyn, who would all be priced out of their respective local markets if they tried to buy today. Only Jimmi Clay could afford his property today with his GP salary of nearly £70,000 when securing a mortgage in Birmingham. Alastair McKee, Managing Director of One 77 Mortgages, commented: “Unfortunately for our best-loved soap stars, the cost of getting on the ladder today would see many of them resigned to the rental sector. Luckily for them, they took that first step when prices weren’t as high and as a result have benefited from some very healthy price growth across the board. Of course, this research is just a bit of fun and in many cases mortgage affordability would be bolstered by a partner or spouses’ income, but it does raise a more serious issue.